AROMA: Perfect Belgian witbier aroma. Citrus, lemon, biscuity yeast, clove, and banana. TASTE: Smooth and refreshing. Citrus up front. Bready yeast in the middle. Crisp, clean wheat finish. MOUTHFEEL: Medium to light-bodied. Excellent carbonation. DRINKABILITY: Uber-high. Light, refreshing, and flavorful. One of the best flagships there is. 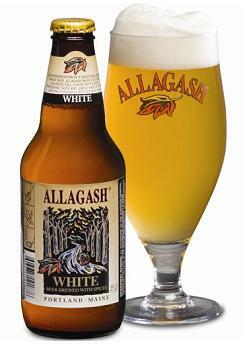 Posted in Tasting Notes.Tagged Allagash, Monk's Cafe, Philadelphia, White, Witbier. Your dissent is duly noted. I should point out that the Monk’s Cafe menu calls the Allagash White the “finest witbier in America”. Just for that Barley, your entire next shipment of beers (If shipping beer were legal) will be a variety of domestic Witbiers. Clown Shoes Clementine is already sitting in the box, just have to wait and see what else I can find. Good review of a good brew! I was fortunate to frequent Monk’s during grad school, and I am now fortunate to live near the Allagash brewery. I am especially fond of the Grand Cru, a fine winter seasonal. The White is great for warmer months by the grill. So with that: here’s to you, here’s to me, gentlemen. O’Neil rack. I’ve never met an Allagash I didn’t like. I’m partial to the Black, Grand Cru, Fluxus, and Odyssey. Very jealous of your proximity to those Princes of Maine, those Kings of New England. Here’s to you, Shaq. There are new O’Neills working the taps these days. I don’t shine shoes no more.